Watching Emma Gonzalez speak is heart stopping. 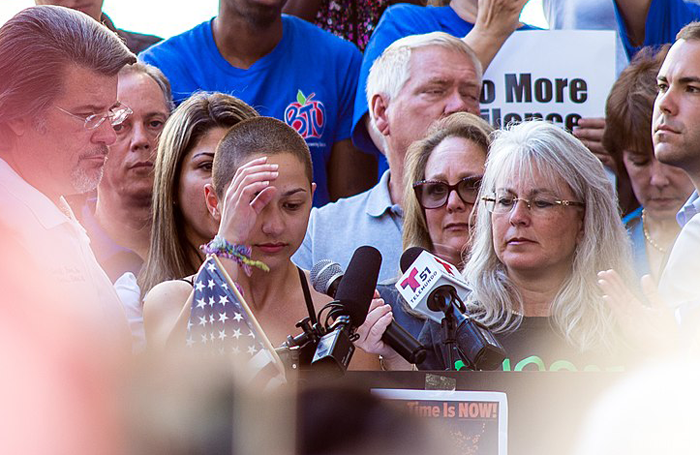 The Parkland shooting survivor, and founder of the Never Again movement, is a study in dignity, her quiet, trembling anger encased in a well of emotion that rises as she breathes. It is emotion that doesn’t weaken, and gives strength to her righteous ire. Gonzalez is a young woman who has had the title of survivor conferred on her by too-imaginable tragedy. She is also an adept public speaker, and more than that, a lead performer. Her ‘We Call BS’ refrain – delivered with rising emotion, tears streaming down her face – was a masterful lesson in call and response, delivered with an innate understanding of the rhythm of speech. At March for Our Lives, her performance was incandescent. Starting with an impassioned plea, she went on to stand in silence for the last six minutes and 20 seconds, the time it took for 17 people to be murdered by one. Gonzalez’ speeches are beautifully crafted theatrical interventions in a political discourse normally dominated by carefully controlled press releases and inarticulate diatribes on Fox News. They are galvanising because they are performative, because they connect with audiences in a place where meaning, form and emotion meet, just as brilliant theatre does. Gonzalez and some of her cohort are self-confessed ‘drama kids’. They are part of the Marjory Douglas Stoneman high school drama club. It doesn’t surprise me, working in community and participatory theatre for 15 years, to see young people who are part of a drama society take the reins. I have watched people go from whispering in the back of a weekly workshop to wide-armed proclamation in a show, mumbling in a community centre to delivering a monologue centre-stage. Participation in drama helps to locate quietened voices, it opens up a recognition of creativity and worth and gives people a platform. Theatre can teach us how to speak. In the UK, as youth services are cut and our young people are increasingly discouraged from speaking, the government’s swingeing educational cuts are denying more and more young people the opportunity to participate in drama at school. STEM privileges sciences above arts, and drama teachers are losing their jobs at an alarming rate. School drama clubs are increasingly rare. Theatres are being put in an impossible position: fill the gap left by the narrowing education system and risk buying into the government narrative that they don’t need to provide arts teaching, or refuse and risk leaving our young people without. Parkland students have been accused of being ‘crisis actors’. Nothing about their lived experience and honest response to it is acting, yet the craft may have helped some of them shape that response. And they learned it at school. Losing the teaching of that craft in UK schools risks losing not only the next generation of actors, but of people who know a little better how to use their voice. Gonzalez’s is the gravest story of the failure of adults. America can do better for its young people. And we can do better for ours.